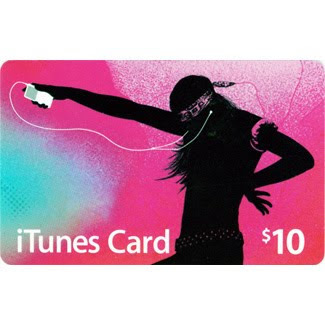 It's Anniversary Week and time for Giveaway #1.
Who wants to win a $10 iTunes card? To be eligible for the giveaway, leave me a comment and tell me the name of a song or two (or ten) that you could listen to over and over and over and never get tired of hearing, OR what songs/albums you would buy with a little extra iTunes money. If you're wondering if you have to have an iPod to win an iTunes card--you don't! You can use it to download music to your computer and listen to it from there...or burn your downloads to a cd. Just wanted to be clarify that for all you non-techy people. Smile. Now it's your turn. I'm all ears. The fine print: Giveaway will close at 10pm on Saturday, October 31. Winners will be chosen at random and posted on Sunday, November 1. Contest is open to US and international residents. You don't have to have a blog to enter, but you must leave a way to be contacted should you win. I so love Christmas music too and have been checking to see when they start playing it on the radio. Every year it's earlier and earlier! I think I would buy Travis Cottrell. I am going to see Beth Moore 11/6 and he will be there with her. cannot.wait!! p.s. i'm soaking beans now! thanks for the bean tips! I would save it for Sara Groves new album which is coming out very soon. I adored her Christmas album and am looking forward to this new one!! After hearing you talk about Nicole Nordeman so much, I'd most likely buy some of her tunage as well as Daniel Renstrom's new Christmas album. Songs I have I listen to over and over are Stained Glass Masquerade (Casitng Crowns), Free to Be Me (Francesca Battistelli? ), Gives You Hell(All American Rejects), & Fearless(Taylor Swift). Ones I want so I can hear then often are By Your Side (10th Ave North), Big Green Tractor(Jason Aldean), In Color(Jamey Johnson), & Voice of Truth(Casting Crowns). I would love the new Casting Crowns album or the Zac Brown Band album. do u KNOW what you're asking of me?! But, something that I just love to listen to over and over and never tire of is James Taylor. hey, mer! I could listen currently to Third Day's Love Song until my ears bleed. Can also do hymns on a continuous loop- Amazing Grace, Come Thou Fount, and of course the best Christmas song, O Holy Night. I could listen to almost anything by Keith and Kristyn Getty over and over, especially Jesus, Draw Me Nearer. Also, am looking forward to Sting's new album to release tomorrow. I love David Crowder and would buy his new CD. I would buy Chris Tomlin's new Christmas CD too! I love Chris Tomlin and a good friend of mine is singing background in it! I'm an iTunes addict. I love finding new music. Last week I started listening to Taylor Swift and I love her music! I've also been wanting some new Christmas music. It's that time of year when Christmas music is all I want to listen to. I love to keep it playing all day in the house. This is my favorite song right now. I listen to it over & over. I would absolutely have to have Michael Buble's newest album, Chris Tomlin's Chiristmas album and oh so many more!!! I didn't even know Chris Tomlin had a new Christmas album! That will definitely be going in my Shopping Cart, with or without a gift card. I think anything Christmas would suffice right now. It's so winter already; might as well make the best of it. It would have to be "What Faith can do" by Kutless. Hi I jumped to your blog from Please Pass the Salt. I could really use some new music to listen to while I run! I could listen to Audio Adrenaline and Jennifer Knapp's rendition of "It is Well With my Soul" over and over again. Last time I checked they didn't have it on iTunes though. Hey Mer~Great giveaway! I love iTunes cards. I'm like a kid in a candy store. LOL So much to choose from.........wow! I could listen to James Taylor and Fleetwood Mac all day, every day. I'm old school! LOL I also love me some Christmas music. We have a radio station that plays holiday music non-stop from Thanksgiving night till Christmas night. I love it! I am going to check out your recommendations too. I love to try new music. I think I would use it to buy Sara Groves new album or David Crowder's new one. I love Christmas music so you have me intrigued with that one..hmmm. BUT I, too, would LOVE Chris Tomlin's Christmas Album. Cause he's just good stuff. As far as what I could listen to over and over and over again?? All I Can Say by DAvid Crowder Band & Revelation Song by Kari Jobe and....I could go on and on but I won't. well right now the newest Jonas Brothers cd gets the most play on my Ipod, but that is because Ben usually has it in his posession!! As for me, I as still in love w/ God of this City by Chris Tomlin and Beauty and At the Foot of the Cross off of His Passiion. however I would probably buy some ABBA if I won. I've been wanting some good dance music lately. First of all, I have to say that the Stealing Home soundtrack is one of my favorites and I am amazed that my cassette tape has not yet met the same fate as yours. I have had it since college and ahem, that was a little while ago. Ahem. Now, to answer your question, I would choose either some Casting Crowns or Chris Tomlin. I also like the song Lay 'Em Down by Need to Breathe. I would get the new Need to Breathe album! Scott Wesley Brown and Michael Card for me. If it were for me, I'd get the Wicked soundtrack. But when I win, it'll prolly be a stocking stuffer for one of the kids. But I still might make them buy the Wicked soundtrack so that I could use it, too. Because it's all about them. I would probably download old christmas classics - I love that music! I think I would go a little bit country and a little bit Christmasy music. Thanks for entering me! Right now I'm listening to Travis Cottrell's Jesus Saves CD over and over. My kids love it too. Happy Anniversary! iTunes is one of my favorites. I would love to get some new worship music. Or some new music for my 14 month son. Or even some new Christmas music or some Christmas music that is old that I don't have on CD form. Love the Blog...I found it from A Familiar Path. I would download some Jason Mraz. Because I adore him. You'll have to check out the songs I posted today (funny we both wrote about music today)--I think you'd really like the "repeat" one! I'm due for some more Natalie Grant, and Casting Crowns--Ooh! And Chris Rice... every time I turn on K-LOVE, I hear a handful of songs that I think I need to get for my ipod. A song I could listen to over and over (and do! ): Don't Stop Believing by Journey. It makes me dance, makes me sing... now that's a good song!! Happy anniversary, Mer! I love your blog and think about you and your words more than you'll ever know! Ok, there are so many things I want to get right now - the new Harry Connick, the new Michael Buble,the new David Crowder Band, some great Christmas music...my list could go on and on. 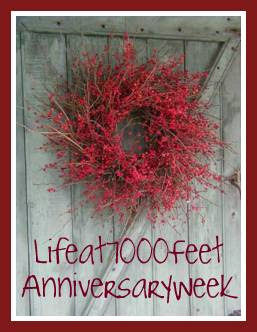 Happy Annivesary, Life at 7000 feet - four years!!! Currently I am listening to Francesca Battistelli, Mercy Me and Chris Tomlin. I am also a big Christmas music fan so I am looking forward to Chris' new CD. But I would probably download Steven Curtis Chapman's new CD (Beauty will Rise)which drops November 3rd. I have been a SCC fan since 1988, so i can not wait to hear his new stuff. What a fun giveaway - very sweet of you. I love Chris Tomlin's music and did not know he had a Christmas CD out, so I would have to get his Christmas CD. I am so out of touch with music that most of the people mentioned in the other comments I have never heard of. I have jotted down the names and will be checking them out. My favorite artist at this time is Josh Groban. I don't know if he has a Christmas album or not, he didn't last year, but if he does that is what I am getting. His voice touches my soul, even when the lyrics are in another language. As for an all time favorite I would have to say Neal Diamond. Ps. Your fine print made me smile. I know it's necessary but it still strikes me as funny that BLOGS need fine print these days. Pss. I cooked beans yesterday and today. You inspired me. My freezer is now stocked with enough beans for 3 meals of Chili. Yum! Anchor of My Soul by Telecast! I'm liking some random songs lately, but one I put on repeat is "I'd Rather Be with You" by Joshua Radin. I also didn't know Chris Tomlin has a new Christmas CD! I'd be getting that... or David Crowder's new one... or... so many! Right now I am quite intrigued with Selah's "His Eye is on the Sparrow"
Love you and I am so excited about your kids being baptized!!! Tomlin's "I Will Rise", Selah's "Before the Throne of God", KAri Jobe's "Be Still" or "beautiful"....I could go on and on! Happy Anniversary sweet friend! I am so glad we found each others blogs and can't wait until we meet face-to-face! When the movie the Passion came out my mother-in-law gave me a CD called His Passion: A Worshipful Journey to the Resurrection. I don't have it on my shuffle, but I've been listening to it almost every day. It's SO peaceful, and the girls love to dance to it. My favorite song is Lord Have Mercy, but all of them are really good. I just found out that Chris Tomlin has a Christmas CD so that would definitely be my "extra spendin' money pick," too!! I am LOVING Toby Mac's "City on our knees". That is an amazing song. I also LOVE Chris Tomlin. What!? Chris Tomlin has a Christmas CD. He's been on my iPod constantly these days. Must...have....Christmas... CD. i love christmas music the best. it's about the only thing i can listen to over and over again. I love so many songs from the 80's.....I know, I'm a big dork. I could also listen to "Islands in the Stream" or "Hard Candy Christmas" from Dolly over and over again! I need some more Mississippi Mass Choir in my life. I have finally figured out how to get my praise on! Or maybe the new Toby Mac, my dd really loves his stuff. Oh this is an easy one...can't wait to get David Crowder's new cd! Toby Mac's City on our Knees...great song! Oohh! I love some new tunes. I would have to get the new David Crowder Band cd.... on second thought, Christmas music is what I really need. I LOVE the Casting Crowns Christmas album from last year - I actually listen to it all year long (it's that good!). I've also found several songs by Phil Wickham that I'm in LOVE with! Or my daughter's favorite - "I Want A Hippopotamus for Christmas"...I have a very funny video of her dancing to it last year (she was ONE). The Laurie Berkner Band's newest tunes for my Pre-K kiddos. Something to groove to during those long, rainy winter recesses.